Do Kidney Stones Cause Paralysis in Cats? 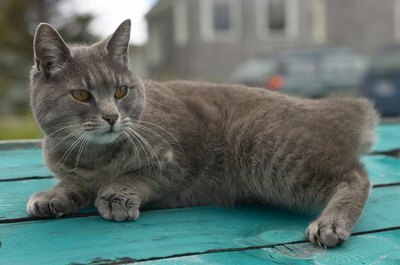 Kidney stones are especially prevalent in elderly cats. If your precious cat has kidney stones, you're right to be concerned about the possible effects of the condition. From bloody urine to excessive vomiting, the ailment can bring upon a wide array of uncomfortable symptoms. If you're worried about what kidney stones, also occasionally referred to as nephrolithiasis, may do to your little one, it may be important to have an awareness of all of its common symptoms. Paralysis is not generally considered to be an effect of kidney stones. If your cat has stones, he may endure frequent urinary tract infections, throwing up, stomachache, bloody urine and pain while urinating. Also, your cat may experience increased frequency of urination but with very small amounts expelled each time. If you suspect that your cat has kidney stones, look out for those symptoms rather than paralysis. Although kidney stones are not usually considered to directly bring upon paralysis, paralysis is a possible side effect of the medication Urocit-K. The potassium-citrate-based prescription medicine functions by minimizing the acidity of your wee one's pee. Overdose of the medication can be extremely dangerous in felines. Not only can it potentially lead to paralysis, it can also cause severe diarrhea and cardiac arrest. Never allow your cat to take Urocit-K without talking in-depth with her veterinarian about it first. Your cat's life and health are 110 percent worth it. If your cat has kidney stones and appears to be experiencing paralysis, waste no time in seeking veterinary attention. Although paralysis isn't usually associated with kidney stones, it can be a dangerous symptom of many other serious medical conditions, including rabies, toxoplasmosis, spinal injury, nerve inflammation and brain tumors. Many felines exhibit absolutely no unusual signs when they have kidney stones. Because of this, it is very important that you take your fluff ball in for routine veterinary checkups, especially if she's on the elderly side. Sometimes, a little diagnostic testing is the only thing that can really tell you what's going on in your pet's health.